Kitesurfing in light winds. Hydrofoil or twintip! 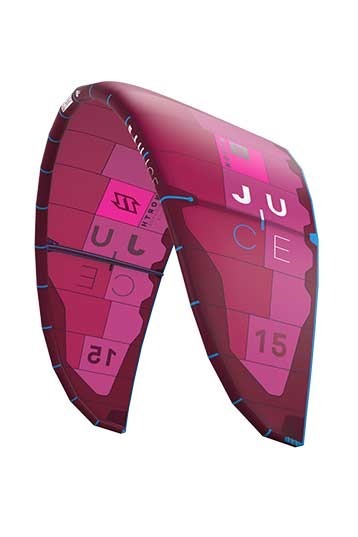 This season the Duotone Juice is a completely new light wind concept - up from now on, any foiler or freerider will only need one size of a Juice in the quiver! Each size works in nearly the same wind range, but with different types of riders on different boards! Due to the brand-new superlightweight construction, the Juices are 15% lighter than in previous season and in combination with the new concept, you´ll be on the water earlier than ever before! Especially foilers will love the constant pull and the very consistent bar feedback during down loops. Big question for me. Do I need a big size Mono or a Juice? Used to ride the old Mono's in around 6 knots. Great but up to a 10 knots of wind and than the Mono doesn't deliver anymore. Could the Juice deliver more performance in it's entire windrange? Well, I had a Foil session with the 15m Juice in gusty 10-14 knots. The wind was harder than I thought so I was a bit overpowered on the Hydrofoil. First, I noticed, was the fast kite reaction. I had 24m lines and the Juice kite reaction was fast and turned in a small circle. So a playful big kite! Second was the long depower stroke. I had to use my whole arm's length to depower. It's a personal thing, but I like a long range to have a long stroke to tune the kite power during the Tack. The power was gradual, even in overpowered situations, downlooping was still an option. The stability was a thing! The Juice had the intention to fly over in the gusts. It corrected itself, but it got my intention to react. So really curious if it holds in low wind conditions. So, surprised by it's fast reaction and short turning. Wait and see if this 3 strut lightwind matador could hold stability under the 8 knots and replace my old Mono.